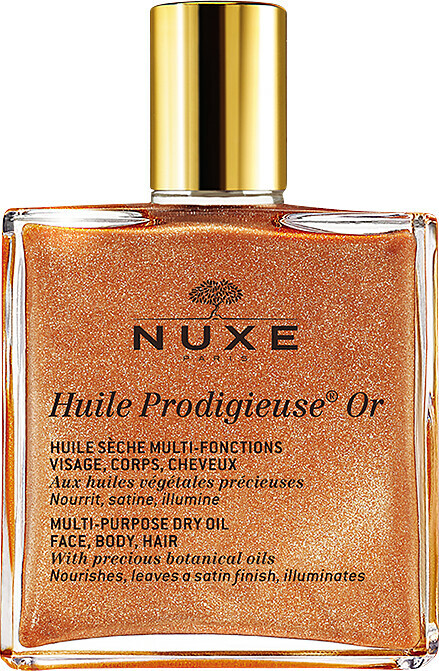 Care for your skin and hair with the Nuxe Huile Prodigieuse Or Multi-Purpose Golden Dry Oil. 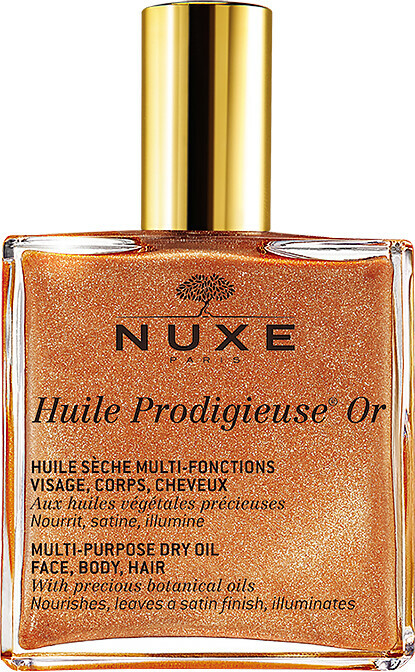 This gorgeous shimmer oil comes in 2 bottle variations, the 50ml size is a screw-top, splash-on version and the 100ml size comes in a spray bottle of the iconic Huile Prodigieuse both are an easy way to liberally apply the oil all over the body, it depends on your preference! Lightweight and dry finish, the silky formula is made up of 98.1% natural origin ingredients with a high concentration of 30% precious plant oils, including borage, sweet almond, hazelnut, St. John's wort, camellia, and macadamia. An added infusion of soothing, nourishing vitamin E ensures antioxidant protection and long-lasting moisturisation. Easily-absorbed, Huile Prodigieuse leaves your skin feeling soft, supple and hydrated, with a comfortable dry touch finish. The hair looks glossy and lustrous, and feels manageable. Apply the multi-use oil to the face, body and hair all year round, in both summer and winter. Smooth over the skin to subtly diminish imperfections, protect the skin and infuse long-lasting moisture. 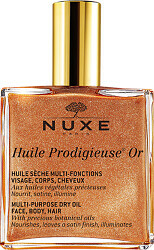 Nuxe Huile Prodigieuse Or Multi-Purpose Golden Dry Oil - Face, Body and Hair is rated 4.5 out of 5 by 15. Rated 5 out of 5 by Anna621 from Just amazing! I was looking for the perfect shimmering oil for so long and finally found it! The texture is amazing and my skin looks so glowy and beautiful! Absolutely in love with this product! Rated 5 out of 5 by Tadhg from Superb oil Excellent dry oil with added bit of shimmer that feels fantastic on the skin. Rated 4 out of 5 by Redkaren from Everything that glitters IS gold!!! I absolutely love this oil and I can't get enough of it!!! I love the smell, it reminds me of a chic Parisian beauty store. It soaks into the skin brilliantly and doesn't make it feel greasy at all. It gives your body a beautiful glistening effect, fab on a night out. I also use this on my face when I can't be bothered to put any foundation on and it makes my skin glow!!!! When I've used this oil it makes me feel pampered and luxurious. it would be even better if they did a splash option like with the 50ml bottle. It's just a shame that they don't in the 100ml option. I definitely recommend this, if you haven't tried it yet get a sample size. I bet you buy a large size within a week!!! Rated 4 out of 5 by BarbaraB47 from Nuxe Golden Dry Oil I really looked forward to using this oil. It does have a lovely perfume which didn't irritate my skin. It absorbed easily and gave effective hydration. But the colour came of on my white top which I was not happy with. It did wash out, so no harm done. I think in future, I will only use this oil on my skin which will not be covered.